A hilarious picture. Poor Avie looks like she wants to flee back to my mother's house. Juna looks like she wants to reach up and back hand her older sister. And Miss Boo? Looks like Miss Boo always does- amusing! And Matt? Fast forward 12 years and I betcha that brown hair has turned white. There's a lot of people reading this blog who don't know our full story. I'd like to share a brief version, because I know some of you are curious. You said so in your emails! Miss Boo was born after years of infertility treatment. Textbook pregnancy and delivery. When she was 14 months, we went back for more treatment. I got pregnant, and had a miscarriage with a D and C.
We decided to adopt several months later. During the long wait, I became pregnant. It's interesting how it happened. I mean, beyond the obvious, heh. We were at our agency's adoption education seminar. (NO, not there!!) We were seated at a table with other couples. I mentioned out loud that since we weren't going to CHina anytime soon, we'd love a vacation. No, we NEEDED a vacation or I was going to go crazy. A Disney cruise sounded great, didn't it? The lady across from me got out a card. Her sister was a Disney vacation planner. Give her a call, see what she could do. Three weeks later and we were sailing! Two weeks after getting home and two lines appeared on a pregnancy test. The pregnancy was rough. We almost lost her several times. I was in and out of the hospital and on bed rest and going in for test after test. It was a nightmare. At 32 weeks pregnant, on Christmas to be exact, I wasn't feeling well. I felt so awful, I should have gone straight to the hospital. I didn't. I didn't want to ruin anyone's Christmas. STUPID STUPID STUPID!! Me, someone who isn't a big Christmas person to begin with! My 3 pound baby was born by emergency C section the next day. It was such an emergency, the doctor warned my husband in private that it, "might not end well." There was a concern both of us wouldn't make it. After only 23 days in the NICU, my 4 pound sweetheart came home. We put all of our energy into her care and making sure she was going to be ok. Oh, she's such a sweet baby. When she smiles, her entire body curls into a ball, she's that happy. She's the kind of person you want to hang out with, if that makes sense. After numerous talks with our agency, we all agreed to continue with the adoption. It was planned so that the baby would be just about a year old when the adoption went through. I think we have all learned that the matching process in China is a magical one. Yes, things happened a bit quicker than expected. But could anyone argue that she isn't the perfect child for our family? Watching the girls together, I am reminded of how well she was matched with us. She is outgoing, she loves music, she is playful, and she adapts so well to new situations. She picks up on new things so quickly. Show her something once and she's got it for life. She's early with her motor skills (as are the other two girls.) Where Miss Boo is dramatic and crazy, Avie is so laid back and happy, and Juna is very serious and more reserved but also a lot of fun and can be quite silly. The sisters balance each other out perfectly- already! I cannot wait to watch them grow up together. No, this isn't easy. I have a whole new respect for moms of multiples. Everyone has that fantasy of twins, but the reality? Yeah, it's a lot of work. And that's an understatement. When I get overwhelmed, I remind myself of everything I've been through in life to this point. I think about the time when Miss Boo was rushed to the hospital for an emergency and I was suddenly surrounded by a team of doctors giving me bad news and I felt the world spin out of control. It's the first time in my life I realized why people who get bad news suddenly lose their footing. And everything we went through to get Avie into the world. That loss of footing happened numerous times while pregnant and after. And the miscarriage- do you ever truly recover from that? That kind of pain is something that you never forget. It smacks you upside the head and keeps smacking you when you get all, "Woe is me." After all I've been through to get these kids into my life and keep them there, I think I can handle two babies at once. I'm a warrior. Yet I'm still an emotional softie. I picture myself covered in armor, but if you remove that armor, you see the Pilsbury Dough Girl. I'm the Pilsbury Dough Warrior. I'm a strong woman, but I'm an emotional woman. I vent. I cry. I get it all out. I don't keep any emotions inside. Maybe I'm healthier as a result? I know people think I'm nuts for blogging it for the world to read, but others also thank me for being honest and sharing the reality of this situation. It's bad. And it's amazing. It's draining. And it's uplifting. Tonight, I had my girls in their cribs. I was singing them to sleep. My singing was making them both laugh. Avie laughed so hard she curled into a little ball. June Bug peeked through the crib and grinned and grinned and said, "Ahhhhh!" I got choked up. My girls! My beautiful babies. There is no doubt I love my children. I'm going to be tired and frazzled and emotional and crazy, but wow do I love my children. Thanks to my mother and Kat for coming over. Thank you, Kat, for going to the Asian market and the grocery store. I could get used to three adults to three children. Don't spoil me, please! I will have more information coming about our trip through customs and immigration- might be helpful for families traveling soon. I'm also thrilled to hear from the other Suichuan Mamas. I will have more tips for you, too, just as soon as I get more time to blog. Wow, such an incredible story. Thank-you for sharing. You left me a little teary eyed. My sister who lost her baby at 7 months pregnant has never found the strength to talk about it nor does she talk about her 3-lb premie experience either. Your strength is amazing. What a wonderful family you have. Congrats! PS. You have a beautiful family... and love your haircut. I love reading your story of how you got to today to have 3 girls in your arms. Beautiful. Inspirational and honest! I can't wait to say I know someone that can help with mommy issues. your girls are amazing. what i couldn't get over is how av responds to juna, her entire face lights up when she sees her sister. i know it's hard, but it is also so rewarding. and it will get easier. and i promise-- you will get to sleep sometime this year! It seems like there are so many things going well... it may be hard to see but from the out side although the change i am sure is HUGE it's sounds like things are going well. I am so glad for you!!! The girls are sleeping well (that's always a blessing), It sounds like Juna's health is good, you're getting on a schedule, you have some help. You're going to be a have it all settled in another couple of weeks. Harvey,Zachary and I are all looking forward to seeing and meeting everyone!!!! If you can just hang in there for a few more weeks it will slowly get better. Then at about 3 months it will all suddenly feel normal. 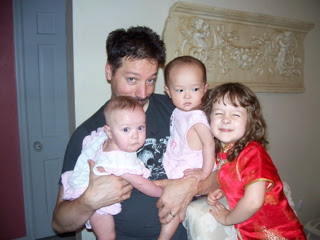 Man - those first few days home from China were brutal - and we only had 1 child to take care of. I remember being dizzy and unable to stand I was so tired. You def. need help - Marc and I were both home that first week and I came close to calling my Mom for more help. I wish I had. We really needed it. Hang in there - I'll see you tomorrow morning. Please remember if you need a glass of wine just pick up the phone!